Old-timers of the iron game knew how to maximize their bodies, squeezing out every possible ounce of functional strength. Looks, while a consideration, were secondary. Just look at men like Arthur Saxon Or Eugen Sandow. Men of exceptional strength as well as ideal proportion. They knew that without strength, muscle was just in the way. Sadly, somewhere along the way this idea was lost. The "Jolly Game of Taming Iron" describe by Russian Olympic lifter Yuri Vlasov has given way to the chrome machines and color-coded Ken-and-Barbie dumbells of today. I'm a huge advocate for old-school strength training for the 21st century! I am a a Licensed Massage Therapist in Nashville, TN. I earned my RKC at the June 2003 certification and was an assistant instructor at the April 2004 RKC. 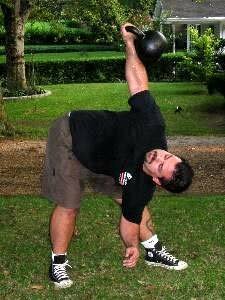 I have conducted several Kettlebell workshops and train clients privately in the Nashville area. I am also an officer in the North American Kettlebell Federation (NAKF). I placed second in the 24 kg long cycle clean-and-jerk event at the 2004 US Girevoy Sport National Competition. I have also been involved in the martial arts for several years and privately teaches close quarter combat tactics and techniques. I am developing a program geared specifically toward each person's unique, personal goals. For more information on internet & phone consultation, upcoming workshops or private training please contact me at irontamerdave@hotmail.com. Don't Call Him The 'Keto Guy' - An Interview With Lyle McDonald. High rep squats work wonders for building muscular bulk and strength, not just for the legs, but for the entire body. The program is ridiculously simple. 20-Rep Squats: The Brutal Path To Massive Gains! 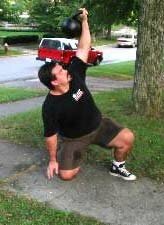 Exercises You Probably Don't Do, But Should: Part 3! 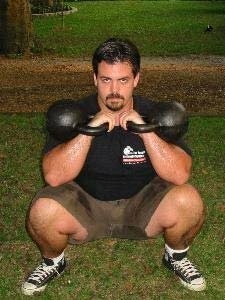 If you think you need a little pick me up to generate more power then maybe the kettlebell drills I have described below will help you out. Exercises You Probably Don't Do, But Should - Part 2! Exercises You Probably Don't Do, But Should!